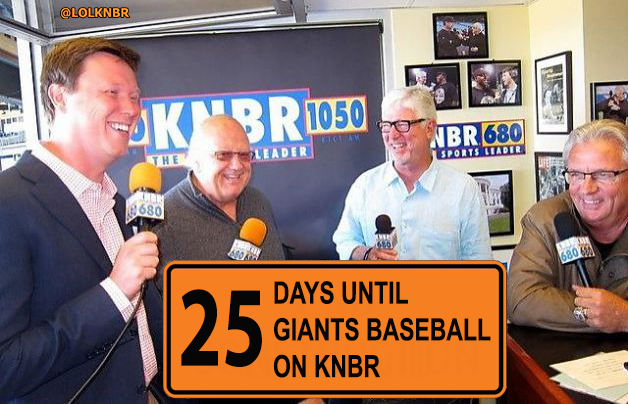 The defending world champion San Francisco Giants unofficially kick off the 2015 season tomorrow with their 22nd annual KNBR-Giants Fan Fest. With most of the team returning to San Francisco for the first time since the championship parade, it’s a chance to whet our baseball-starved appetites and hear a little Giants talk on the radio. It’s mid-afternoon now as I start to write this and already the player quotes and offseason hair updates are flowing in, however before I pack up my pup tent and suitcase for the long night of camping out in the rain for Fan Fest, a couple quick notes on the folks who will cover the team this season. First, San Jose Mercury News/Bay Area News Group Giants beat writer, Alex Pavlovic has signed with Comcast SportsNet Bay Area to be their new Giants Insider. (BASG will serve as the Javier Lopez to Pavlovic’s Madison Bumgarner, filling in for CSNBA throughout the season when Pavlovic has the night off.) You may remember the position has been open since last December, when long time beat writer/insider Andrew Baggarly announced he was leaving CSNBA to write a book. For those of us nerds who like to speculate on such things, it isn’t all that surprising to see Pavlovic take the Giants Insider job. After the 2011 season, when Baggarly left BANG to take the new position at CSNBA, it was Pavlovic who replaced him then, as well. Pavlovic picked up right where Baggarly left off and made the change seamless for fans. He has an honest, even-keeled approach to writing and he mixes in the right amount of humor and snark with his reporting. I especially enjoy his late night blog posts with second thoughts and quotes and random tidbits of information that didn’t make it into his game recap. Pavlovic takes over just as the duties of Giants Insider appear to be shifting. Last season, Baggarly spent a lot more time in front of the camera, doing TV hits before and after games, and even appearing in studio as an analyst when CSNBA cut back on his travel with the team. How much this new gig changes Pavlovic’s reporting style remains to be seen, but my guess is not much, however it will be interesting to see how the transition from “lineup monkey” to TV star goes for him. Pavlovic told me he’s really excited about the new challenge in an **EXCLUSIVE** direct message on Twitter! With Baggarly covering games from home in his robe and slippers and Pavlovic rubbing sweaters with Ratto, we have some intriguing questions left unanswered. Who is next man or woman up to replace Pavlovic in his old position at the Merc/BANG? Do they go with an in house candidate like Carl Steward or look elsewhere? Also – and probably most importantly – how do these changes affect Giants Twitter? I’ve really become attached to the unique combination of Twitter personalities covering the Giants beat these last few years. You’ve got curmudgeonly Hank playing the salty veteran, Baggs the golden boy, willing to stir the pot, and Pavs the kid, posting silly GIFs and Vines of Bumgarner chugging beer. The other bit of news from this morning comes from David B. Flemming himself, on KNBR 680 with Gary Radnich and Larry Krueger. Gary was doing his usual make-the-guest-and-audience-and-cohost-incredibly-uncomfortable-with-these-super-awkward-questions schtick, prodding Flem about his broadcasting aspirations while alluding to a potential split from the Giants in his future. It was classic Radnich to leave his guest twisting in the wind, but Flemming is no stranger to these questions, in fact he’s been asked about this before on Twitter, and to his credit, he has answered fans directly. Still, while Radnich can be annoying with his half-joking/half-true/all awkward line of questioning, he knows a lot of Giants fans out there do fear that someday Flem will fly the coop for supposedly bigger and better things. Flem does appear to be bucking for the title of Hardest Working Broadcaster in Show Business, with his constant flow of college football and basketball play-by-play assignments for ESPN. Some Giants fans can’t help but wonder if he’s working towards a national job when he’s broadcasting Thursday night college football games instead of the NLCS, or missing championship parades to catch a flight to Nowheresville, USA. As a fan of the best broadcast team in baseball – maybe in all of sports – it kind of makes you nervous to see Flem blow up like this. He’s young enough and talented enough to do anything he wants, really. The Giants job is great and all, but who could blame him for jumping if a much better offer came up that paid him a lot more money and put him on track to be the next Al Michaels or Jim Nantz? Well, that day may still come, but for now it’s not something to be concerned about. After a barrage of pokes and prods from Radnich, Flemming finally (good-naturedly) defended his loyalty to the Giants and let it be known he recently signed a new contract with the club. Gary: "When will you be leaving the Giants?" Dave Flemming: "I'm not leaving the Giants anytime. I have a new Giants contract!" Unfortunately, Gary & Larry were too busy flapping their gums to ask a follow-up before moving on to Fan Fest, so after the segment was over I reached out to Flemming (again via **EXCLUSIVE** direct message on Twitter) to ask if his role with the Giants would change with the new contract. Okay, slightly fewer Giants games maybe doesn’t sound like exactly what Giants fans were hoping for, but let me tell you why I think this is great news. First off, the Giants have no intention of letting Flem walk. He’s the heir apparent to Jon Miller, and contrary to what Salty in Clovis might say, Larry Baer is no dummy. He understands the value a great broadcasting team adds to the franchise. When you have a good thing going like this, you don’t break it up. Second, the two sides are willing to work together. After a couple years of ESPN pulling Flemming away, the Giants could have given Flemming an ultimatum – you’re either a Giants guy or an ESPN guy. That hasn’t happened. In fact, Flemming seems really happy with how the two sides have coexisted. It’s not surprising when you consider how long Jon Miller worked for both entities. Lastly, Flemming himself seems really grounded and happy here in San Francisco. He’s local, he loves the guys he works with, and he clearly feels loyalty toward the team that gave him a shot at the big leagues. Terms on these kinds of deals usually aren’t publicized, but it’s safe to assume Flemming’s contract will probably keep him with the Giants for another five years or so. That should make Giants fans feel a lot more comfortable when Flem hits the road during the season. And it should make them feel confident that Baer and company will do what it takes to keep him around for a very long time.